This was the mind-map process of what my capstone was going to have. Sociocultural: The learners come from a lower income background. In the school they attend 74% receive free or reduced lunch. The total school population consists of 893 students of which 672 are Hispanic/Latino, 117 are white, 46 African American, and 58 are other. There are a lot of absences in the classroom and that translates to missing work and late assignments. The learners are motivated when the teacher incorporates concepts that they are familiar with or have prior knowledge about. The learners also get excited when they learn about new topics that they haven’t learned before if they are presented along with images. The learners drive instruction because if they do not understand the lessons the teacher has to go back and try to re-teach it. Informational/Technical:The current learners have a one to one Chromebook they can use during school hours. The learners also have access to the smart board that is used daily in the classroom. However, not all students have access to technology outside of the classroom. The designer will be using OCDE Project GLADⓇ strategies to empower the learners to achieve the goal of increasing comprehension in both languages. GLAD strategies will include CCD chart for new vocabulary, Chants imbedded with academic vocabulary, Pictorials for bringing literature and new vocabulary to life, Mind Maps so the learners can transfer the information over. In addition, the designer will introduce a new technology piece by having students use www.storyboardthat.com. This web site allows students to retell a story digitally. Students will be able to retell a story using digital images to get the main points across. Eventually the learners will be able to write a report supported by all the strategies used and thus improving their transliteracy and comprehension skills. Teachers have to develop lessons with student’s perspectives in mind; teachers must be the help or the facilitators. Dervin suggests that teachers keep their student’s perspectives in mind when developing lessons. In Dervin's article,"Sense making The Mind's Eye" she states, "that human use of information and information systems needs to be studied from the perspective of the actor, not from the perspective of the observer". My students are the seekers, the curriculum is the gap, and the use is me, the teacher. I have to develop my lessons with my students perspectives in mind, not my own. I usually prepare my lessons by looking at the teacher edition and taking a look at the standards and where they have to be at the end of the lesson. I am now finding myself questioning why I am doing that. I am starting to understand that as the teacher I should facilitate my student's learning and have their questions guide my teaching. I need to provide the best learning environment and let them problem solve as a team. Let them know that if they don't get it right the first time it's ok, making mistakes is part of learning. ​In addition Baggio states, "By using powerful visual images to impact the way people learn, you can increase the probability that the learner will learn. By positioning him or her in the learning zone, a place that takes into account where the learner is and what we know about learning, you will have created an environment that supports the individual's ability to learn" (Baggio p.9). 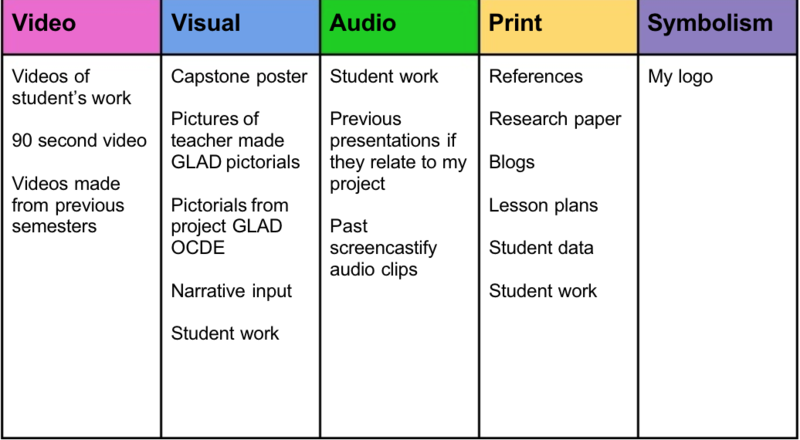 What I took from this was that students need meaningful visuals so they can better connect to the material learned. Another key point I took from Baggio was the fact that prior knowledge is very important to help make connections and help make sense of new information. " Taking advantage of prior knowledge helps the visual system resolve this ambiguity" (Baggio pg 43). Again, the use of meaningful visuals that students can possibly make connections and activate prior knowledge. When creating my logo I wanted to bring Dual Language Immersion into the design. I had a hard time coming up with a design. I first came up with an image of a person sitting and reading what could be a book or an electronic devise. As my driving question evolved so did my logo. I wanted bilingual transliteracy to be the focus and so I found my logo. Using a brain and arrows that represent the information processed in English and Spanish. This logo represents just what I was looking for. Students way of processing information in both languages across multiple subject areas. (Informational sub context) is the books we are reading, Baggio, Clark, Dervin. This is where I am getting information to build my action research and how to best support my students. The opportunity(technical sub context) is all the time we have in class to explore and research new technology that will ultimately help my teaching by helping my students achieve their learning goals. Finally my motives (Sociocultural sub context) are my students and getting them to achieve at grade level reading comprehension scores.